Don’t miss this fideuá recipe sent to us by Rosalía, from Ross Gastronómica. 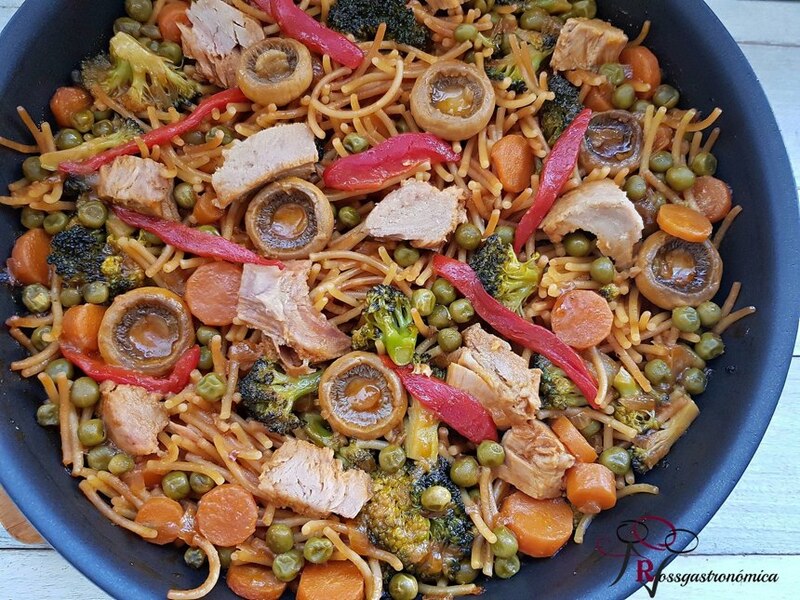 Fried noodles, vegetables and white tuna are the main trio of ingredients for this recipe that can hold its own against paellas, barbecues or any signature dish. Fry the noodles first so that they are ready and the fideuá can be prepared quickly and directly. Put oil in a pan and fry the noodles until they turn golden. Stir continuously so that the noodles are cooked and do not burn. Once the noodles are golden, drain (with a container underneath to keep the oil) and put to one side to cool. Meanwhile, get all the ingredients ready, because from this point preparation of the dish speeds up. Cut the onion into small pieces and the carrot into slices. Crush the garlic in a mortar. Open the can of white tuna and drain the tuna in a colander. As with the noodles, save all the oil to use later. Measure out the vegetable stock and put it in a saucepan on the heat - it needs to be hot. Cut the red pepper into strips. Slightly break up the block of white tuna. Separate small broccoli florets, wash and put to one side. Remove the stem from the mushrooms, wash them and put to one side with the broccoli. Put the oil from the tuna can in a frying pan or paella, and if necessary add some of the oil used to fry the noodles. Gently fry the onion, carrot and garlic in that oil. When onion is transparent onion, add the tomato concentrate and sauté a few minutes. Add the broccoli florets and mushrooms. Sauté for three or four minutes to absorb all the flavour of the sauce. Add the stock and the peas, taste and add more salt if required, and cook until the vegetables are tender. Add the noodles and let it boil for about 5 minutes. When the stock has reduced by half, place the strips of red pepper and pieces of white tuna on top. Cook for the remaining time indicated by the pasta manufacturer. Turn off the heat and let rest for 3 minutes.